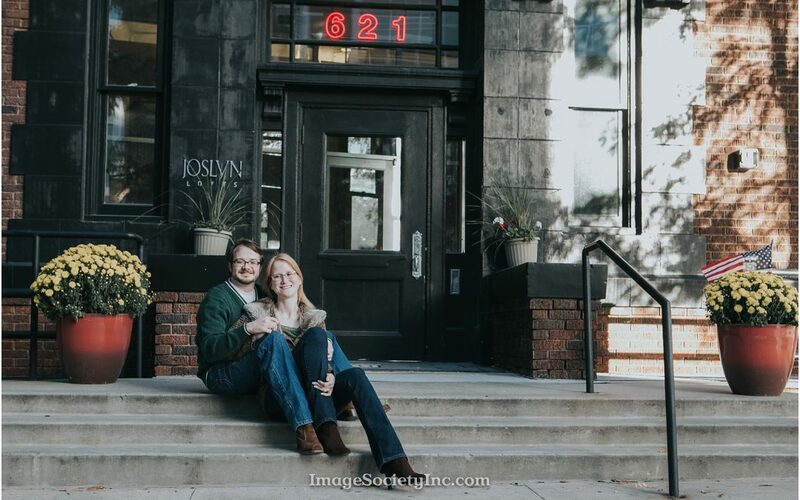 I was honored when this couple asked me to do their Omaha fall engagement session and the Lincoln wedding! I have know the groom for a VERY long time! We were in the same grade growing up! So from K-12, I have known this guy! In high school, we were in FCA together and that is when I feel like we actually became friends rather than classmates! We had so many great times. I remember on our senior trip, he somehow managed to get the fight attendants to give him a HUGE bag of peanuts. How this kid came off the plane with a giant grocery bag FULL of peanuts is still a mystery to me. Anyway, here we are years later and he has found the love of his life! Brandy is sweet and loving and really the total package! For their session, Scott took the our around our studio in the Old Market of Omaha. It was a beautiful fall day and the trio was able to get a great variety of images!